There is nothing quite like the feeling of a product line expanding to include even more family members, don’t you think so? Hence, here we are with good news that the Lumen range will be getting yet another addition – we are talking about the LuMini, which is a smaller and more affordable version of the Lumen TL800, and it is already available for pre-order on the famous crowdfunding site known as Kickstarter. The Lumen TL800 happens to be an app-enabled Bluetooth smart bulb, where the team over at Tabu decided to take note of feedback that they received about the TL800 into consideration before setting out to work on a smaller and more flexible version – the LuMini. Being smaller in size, this would also mean that it will be easier on your bank account in the long run. The whole goal of the LuMini is to make sure that smart lighting remains accessible to everyone, where it will hopefully be able to transform the concept of the smart bulb from the bulb of tomorrow to the bulb of today – and every single day, too. 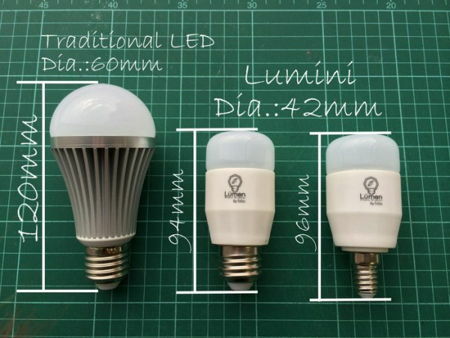 The LuMini happens to be an LED RGB (Red, Blue and Green) bulb, and it is 50% smaller compared to traditional LED bulbs, arriving in E12, E14, E17, E27 andE26 standard sockets. This ought to give you some peace of mind since those sockets ought to play nice with majority of the lamps out there. Using funds that are raised from the Kickstarter campaign, Tabu will then move on to finish up the firmware design and production molding, while working to increase Android device compatibility. At this point in time, Lumen plays nice with Nexus 7 (with Android 4.3 Jelly Bean) and Galaxy S4 (with Android 4.2 Jelly Bean), where recent models of the Lumen TL800 and the LuMini will also be compatible with Samsung phones with Android 4.3 and above. Pledges for the LuMini begins at $25 for the first 200 backers.